We've got something fresh happening and for hummus sake! Banana Wonder's first ever guest post. 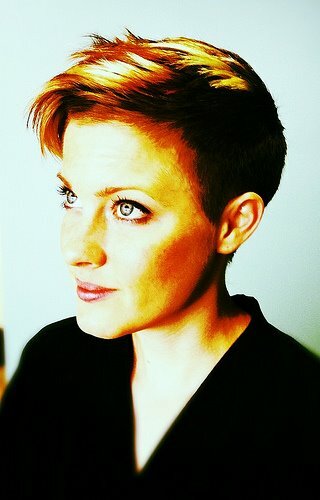 I met Laura, aka Hotlanta as my LA friends like to call her, a few years ago in San Francisco at a Blogger conference. We've stayed in touch over the last few years (note: this girl has the most insane ripped-lady selfies) and both share a love for whipping up crazy-delicious hummus. Allow no further introduction, take it away Laura! Hi! I’m Laura from Sprint 2 the Table! Sprint 2 the Table is a collection of recipes, food adventures, races, strength training, and general pontification. I live my life from meal to meal. Sometimes I think I’m just hustling through my daily activities so I can get to the next occasion for mastication. At bedtime some people count sheep, some people have lull-a-byes… I fall asleep at night thinking about what I’m going to eat for the next day. It’s a sickness, I know. Oh, and I also run. 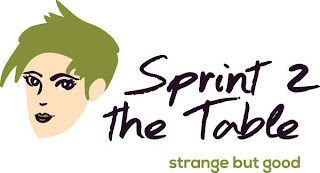 Each week on my blog I host a link up called “Strange But Good.” I love to combine flavors and ingredients that many would classify as strange, but they really do work! For this exchange with the Hummus Queen, I thought I’d subject you to some #strangebutgood hummus. We all love hummus. We all love guacamole. DOMA was overturned, so I think it's high time these two be allowed to marry. It makes a delicious combination, not to mention an extra-healthy dip. You know when you go to restaurants and the hummus is impossibly creamy and fluffy? Try as I might, I could never replicate it at home. Until I learned the secret to the Holy Grail. Peel the chickpeas. Thanks everyone for reading! 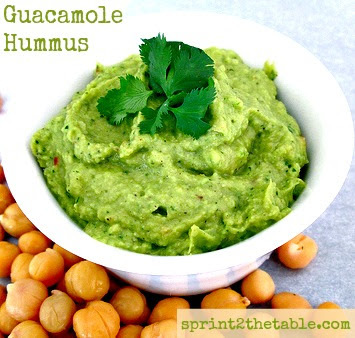 I hope you’ll come say hello over at my blog, Sprint 2 the Table, and check out Anna’s hummus recipe (The Most Luxurious Hummus Ever) today! 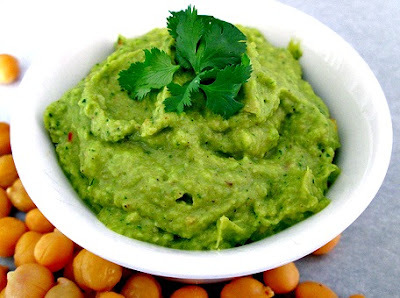 In a blender or food processor, combine the avocado, chickpeas, jalapeno, cilantro, onion, garlic, lime juice, pepper, and ground cumin. With machine running, add water in a slow, steady stream. Process until the mixture is smooth, and there are no longer any lumps in the dip. Adjust seasonings to taste. Serve immediately, or store in an airtight container in the refrigerator until ready to use. I have to admit, I'm so damn lazy that I will usually just add oil or the water from the bean can just to get a creamier consistency without having to peel those little buggers! Ha! I found you over on Laura's blog and I am so glad I did! I've been popping around your blog for wayyy longer than I should have been, and just love it! This is one #strangebutgood marriage! Love the combo! Are you EVER going to come crash ATL? Laura is my blog lover! Just saying. LOL- Laura if you're reading this... Yep, I have come clean, ha ha ha ha!!! Good idea. Why restrict it just to chickpeas. Love the idea with guacamole as well.